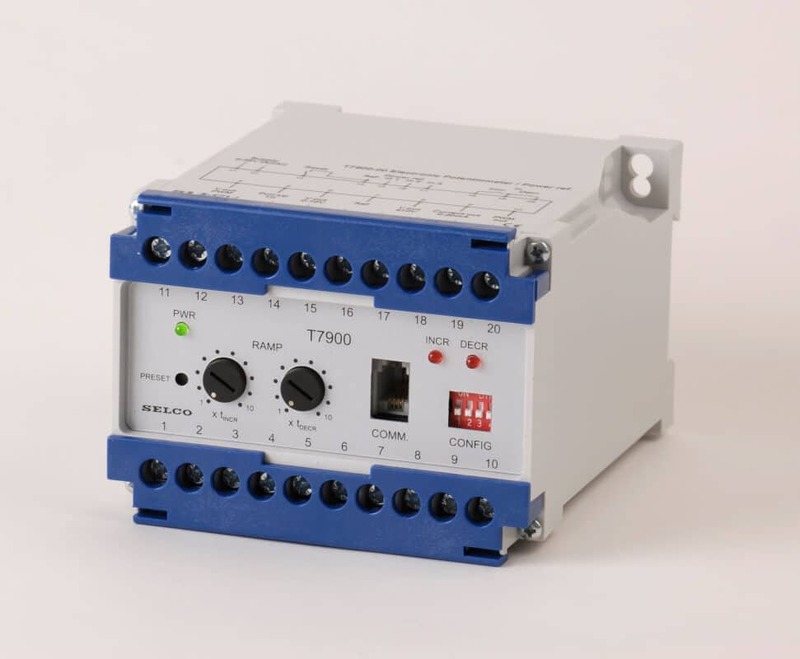 The T7900 Electronic Potentiometer is typically used as an interface between a unit that provides increase/decrease contacts signals and electronic speed governors or voltage regulators (AVR) controlled by analogue voltage or current signals. The T7900 works much like a conventional motorized potentiometer (e.g. the SELCO E7800); however, instead of a variable resistance, the T7900 provides a variable voltage (e.g. -5 to +5 VDC), current (e.g. 4-20 mA) or a pulse width modulated signal (PWM). The voltage and current range is programmable. The PWM output provides a 500 Hz signal with programmable duty cycle. The analogue outputs are galvanically isolated.